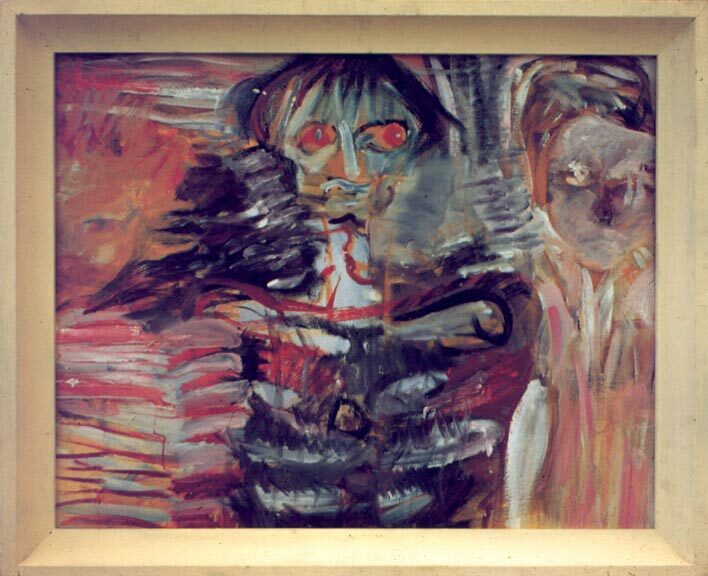 The painting of Three Friends is a minor work from college days, 1952 - 1960. But it carelessly represents a cross-section of influences and aspirations. I wanted to express life. Thus the people and our relationships, a personal view. 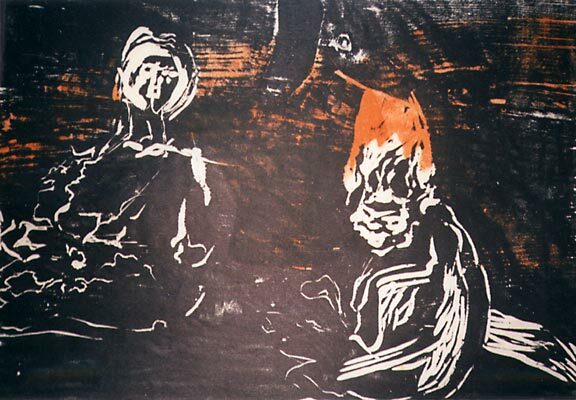 I was under the spell of art history, but especially Zen ink paintings and abstract expressionism. Meet Carol Lind (me), aglow and peeking from the left. Encounter Carol Hoorn Fraser, the skeletal dynamo in the middle. Round out the group with Toni Potter, intensely thoughtful, to the right. There's much more to show for this period. 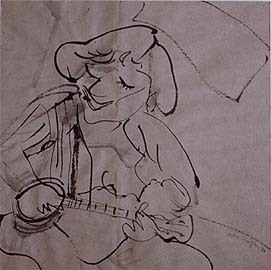 Mama, an ink painting in Japanese Sumi-e style, 1958. See several more ink paintings. Tropical Fish Aquarium paintings. Collection of Steve Stephan Olson. 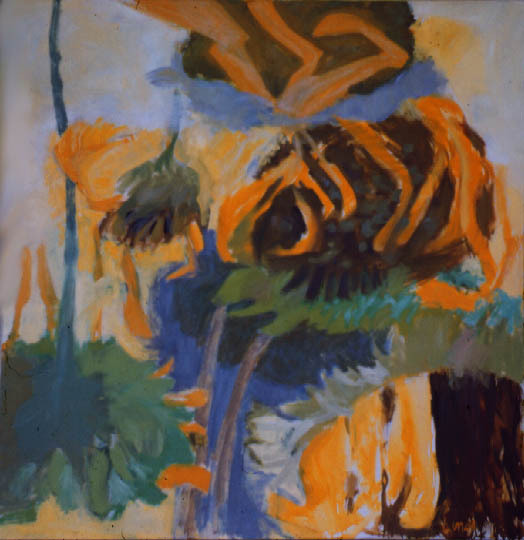 Sunflowers, an oil painting, 1957. Stolen. 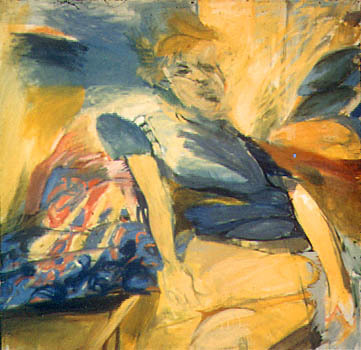 Indecision, oil, 1958 or so. Stored by someone or lost. Leaf poster, acrylic on cardboard, 1959 or so. Old Mr. Geary, an oil painting, 1959-60. Collection of Wim Roefs and Eileen Waddell. MFA thesis work listed on the Minnesota page. Short moves to east and west coasts (called UofM NOT). 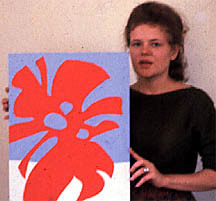 I worked on the MFA degree from 1956-1960 with time out to explore the art world on either coast. In 1957 it was San Francisco, California on the west coast. In 1958 it was New York City, New York on the east coast. Here's a start on those stories. Back to Minnesota Art page.